Upshire are two points clear at the top of the Premier Division after a 10-0 thumping of Liberty Stars yesterday. Richard Howard netted a hat-trick for the home side with John Gregory (2), Ryan Dear, Danny Curbelo, Ben Darwin, Daniel Brooks and Tyler Dangerfield all netting to take home maximum points. Lactico are not far behind as they secured a comfortable 3-0 win on the road away at Flanders on Sunday. Courtney White was on target with a double, adding to Karim Flavien’s third to carry their side to victory and move up to second position. Quality Control picked up their first competitive victory as they edged a tight encounter against fellow new boys, Downs, to win 3-2. The win moves the hosts up to fourth on goal difference behind their opponents. Aldborough Hatch appear to have their hearts set on a quick return to the Premier Division as they beat a good Emerson Park side 6-3 yesterday. James Gibbings netted twice, accompanying Jey Sivapathasundaram, Terlochan Singh, Tom Gibbings and Kevin Greetham onto the scoresheet. The win keeps them top of the table as we approach the end of the first month of the season. In what already looks like an incredibly competitive division, Korona Redbridge have moved second in the table after a narrow 1-0 win yesterday against St Augustines, making their first outing of the season. Dawid Smolarek scored the only goal of the game as Korona remain unbeaten so far. Barking are back to winning ways with a 6-1 victory against Valley Park on Sunday at Mayesbrook Park. Kastriot Vata netted a brace with Daniel Cook, James Jacobs, Ben King and Michael O’Brien also finding the onion sack to take the points back home with them. Barking & Dagenham Wanderers are also keeping apace and saw off the efforts of Dagenham United in a 5-2 victory. Nick Read got himself on the scoresheet twice with Lee Bartle, Liam Roney and David Cole confirming maximum points for the second time this season for the boys in blue. It was a great day for Chingford Celtic who put their opening day disappointment to the back of their minds and executed a comfortable looking 7-1 victory against Warren United Reserves. That win moves them up to fifth place in the table. It’s about as tight as it could be in Division Two with three sides level on points at the top of the table separated only by goal difference and alphabetical order! Park Tavern’s excellent start to the season continues as they edged a close match with Docklands Albion 3-2. David Hornsby’s scoring streak continued with a brace with Kristopher Brown also netting to cancel out Albion goals from Roberto Rosero and Wilson Diogo. Another tightly contested match saw FC Mexico hold second place with a 2-1 win over E4 Rangers. Ashley Mills was on target for the E4 boys but that goal proved just to be a consolation for the visitors. A late Waltham Athletic goal carried them to a 2-1 victory at the County Ground as they edged a tight match with Morfdown Elect. Goals from David Bomani and Charlie Saywood proved just enough to confirm maximum points and third position in the table. Romford Galaxy picked up a first win of the season as they travelled to London Fire Brigade and came away 1-0 winners in a close match. That win moves them up to sixth place in the table with London Fire Brigade still winless so far. Wanstead United have gone top of Division Three after securing a third win on the spin. They beat previously unbeaten Alliance United with a late goal as Donavan Reynolds and David Nott scored the all-important goals to take the points back to east London. 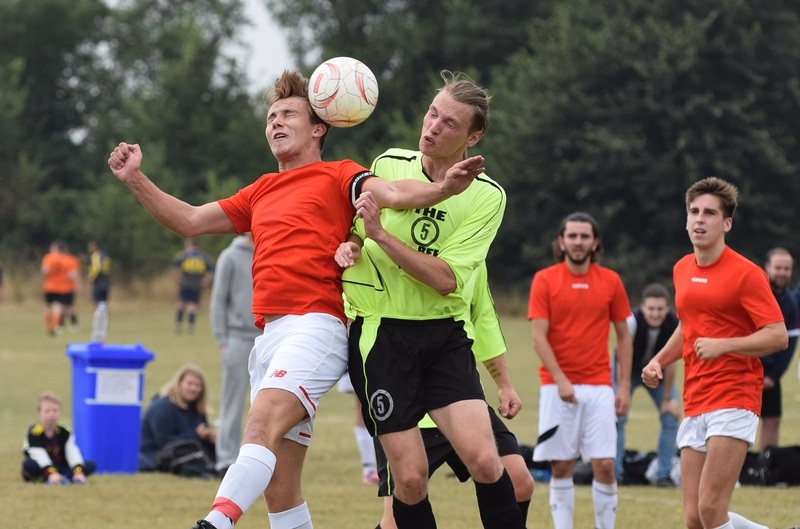 Asianos Reserves made their debut in the league on Sunday and opened up with a win by the odd goal in five against Upshire Reserves, inflicting a first defeat on their opponents in the process. Taylor Andrews and Luke Casey were on target for Upshire but proved in vain ultimately. Fairlop Rangers scooped their first win of the season as they defeated AC Milano Reserves 1-0 in Walthamstow. That win moves them off of the bottom of the table and up to seventh position. It was raining goals at Belhus Park on Sunday as SL Menfica played more like SL Benfica, laying the foundations for a title charge with a 13-2 victory over Goresbrook. William Sheehan stole the show with a quartet of goals while Jake Muller, Thomas Rice and George Boffa also got in the act with doubles. And not forgetting Lewis Clark, Richard Beard and Joshua Troy who rounded off the victory with goals of their own to maintain a perfect start to the season. Continuing the theme of goals are Hornchurch Oakmont who put ten goals past Chinglow for one reply. Ross Woolward, Luke Sawyer and Harry Mardel netted braces with Luke Newman, Chris Caston, George Terry and Michael Ward completing the scoring. Marco Parrello was Chinglow’s marksman for their only goal. Up to third place now are Grey Area who saw off the efforts of Central Colts with a 2-1 win courtesy of goals from Sonni Barnard and Josh Malone. Oak Royals picked up a second league win of the season as they ended Epping Forest Falcons’ unbeaten record. Kane Shelton scored twice and Harry Goodman and Daniel Gotobed one each to carry their side to a 4-2 victory. Heathside remain unbeaten after three games and move fifth, beating William Fitt by the odd goal in five at Castle Green. Kyle Brown and Alexander James were on target for Fitt with their goals as they move to seventh place.